Has it become another trend to judge someone else’s life online? 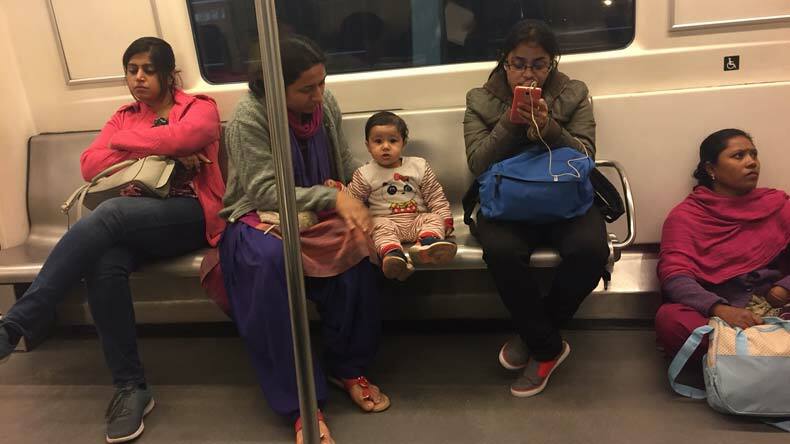 A few days back, a picture that surfaced online took Twitter by storm where a woman was seen on a seat in Delhi Metro with her baby while the child's nanny was sitting on the floor. The post started a discussion on the caste system making the woman look like a promoter and supporter of it. But were we missing something? Was some fact not adding up? Well, a recent blog from the woman's point of view will make you realise that we 'the learned' Internet users had gone wrong and had ignored both sides of the coin! The picture that went viral on Twitter showcased a woman taking a seat in the metro with her child, while her nanny was sitting on the floor. Well, this all started with a metro journey. A woman with her child and nanny were on their way back home. Everything was normal until a Twitter post came up. What happened throughout the metro train journey went viral online with a picture taken with an absolute perception to make it look like something very different. The picture that went viral on Twitter showcased a woman taking a seat on the metro with her child, while her nanny was sitting on the floor. The picture was simple but the caption it had portrayed the story from a different angle. The woman was claimed to be inhuman and a promoter and also a supporter of the caste system by the ‘responsible’ journalist who clicked the picture. A few days later, the woman in the picture, an AIIMS doctor shared her side of the story which made me think about the false online trend, which is making people believe anything and everything they see online. The responsible journalist not only played with the facts but did not come to help the woman and nanny with their luggage in the first place. Here again, we sat on our judgement seats with those biased glasses and started contemplating. Well, yes I too believe that the photo was misleading to a point. The way the journalist had set her frame will make you judge the woman sitting with her baby while the child’s nanny sits on the floor. But what about the other part? Prominent media persons from Tarek Fateh to Shekhar Gupta too took the journalist’s side. Unfortunately, they did not investigate all the facts and retweeted the story supporting the journalist’s point of view. Following their footsteps and taking it as an example most of the people did the same when they re-Tweeted out the tweet. I have also seen the picture and I do think that without the given caption the picture would have looked like any other Delhi metro scene when most of us struggle to find a seat and plonk on the floor of the train despite repeated requests by the Metro officials to refrain from doing so. But no, what’s there if there is no sensationalism in the story on social media. Coming to sensationalism, as a media aspirant I strongly criticise the journalist who misused her intelligence and technology at the spot. As a journalist, she should have been more responsible. We all know the power of social media and the fact that with great power comes great responsibility. But the journalist ignored every other aspect of the story and chose to do something which was unethical. She did not only maligned the image of this woman but also misled the people with her perception. And I won’t call it her mistake only but we people are wrong too. We are wrong when we believe everything trending online. We are wrong when we just don’t even try to go through every aspect of a story. We are wrong and we need to work on it. Adding to my opinion, I will call it a case of mere comprehension. A woman shared a story on the social media which went viral and people started contemplating over it. Common people chose their sides while media people gave it an angle and made it national interest news. Shekhar Gupta, a senior journalist wrote another article supporting journalist’s claim and gave it some more unwanted footage. So basically, a mere picture was able to initiate another discussion on the caste system and class difference. Just one question, where we people are actually lacking? Have we become so sensitive that a single picture can make us judge somebody’s life or has it become another trend to follow online?